“What have these people done to music?” wails Sallie Ford on Dirty Radio‘s explosive opener, “I Swear.” She’s raging against sound-alike pop stars foisted on the public by mainstream media, but it’s a question worth putting to the interrogators, too. The answer: Sallie Ford & The Sound Outside vigorously mines a sweet spot between modern and vintage. Sallie’s voice has elicited comparisons to classic jazz and blues icons, yet it is stoked with the fire of youth and rebellion, too, an instrument capable of conveying raw emotion and nuanced artistry in the same breath. Since 2008, Sallie Ford & The Sound Outside has been intertwining elements of swinging roots rock, country, jazz, and blues with a contemporary lyrical stance and Ford’s instantly recognizable voice. The Portland quartet has steadily ascended through the ranks, earning a growing following throughout the Pacific Northwest. Ardent evangelizing by nationally-recognized peers like the Avett Brothers has augmented that momentum. Now, with the release of Dirty Radio, Sallie Ford & The Sound Outside offers the most fully-realized example of its aesthetic yet. Sallie’s affinity for the odd and unusual eventually served as a gateway to discovering her own voice, both as a singer and composer. In her childhood, she’d been transfixed by the Beatles’ catalog. As she matured, idiosyncratic acts such as CocoRosie, Cat Power, and the Squirrel Nut Zippers were introduced into her musical mix. “Tom Waits was a big inspiration to me,” Sallie adds, recalling how she scrutinized every aspect of Waits’ 2002 album Alice, and soon his abilities as a storyteller rivaled the Fab Four in her estimation. While Sallie mustered the courage to sing a few times at open mic nights in North Carolina, her progress was tentative until she moved to Portland in 2006, where the newcomer found herself increasingly willing to step up and perform. “I was blown away the first time I heard Sallie sing,” admits Sound Outside guitarist Jeffrey Munger, who initially crossed paths with her while busking during the monthly Last Thursday art walk on Portland’s Alberta Street. By then, Sallie had already graduated from solo slots to playing out with the rhythm section of drummer Ford Tennis and upright bassist Tyler Tornfelt, a pair of Alaskan transplants who’d been making music together since their earlier teens. translates into guitar chords (sometimes with assistance from Jeff). But the interaction between members is an integral part of the creative process, too; the singer cites drummer Ford Tennis’ inventive, self-taught approach to his instrument as one of several key variables that contributes to their unconventional groove. Public enthusiasm for the band’s live shows and its self-released 2009 EP Not An Animal have helped them garner fans near and far. “People in the music community have been really kind, introducing themselves and offering to help out where they can,” says Sallie. The Avett Brothers’ Seth Avett was so taken after seeing Sallie Ford & The Sound Outside, he tapped them to open a pair of sold-out shows at Portland’s Crystal Ballroom in summer 2009, and invited them to be their support act in California and Colorado. New Year’s Eve found Sallie Ford and the Sound Outside performing at the 7,700-seat Asheville Civic Center with the Avetts and Langhorn Slim, the highlight of a string of Southeastern dates and the beginning of an auspicious twelve months; come the end of 2010, the quartet would be playing with Mavis Staples at the historic Egyptian Theater in Boise, ID. Throughout 2010, the band recorded and refined Dirty Radio with engineer Adam Selzer (Norfolk & Western), with a few additional tracks overseen by Mike Coykendall (M. Ward, She & Him, Blitzen Trapper). “I knew we would come up with something special, just because of the sound on the records that I really liked that those guys had done, music that had a warm tone to it,” says Sallie. They recorded to tape, and though the performances aimed to capture the feel of the foursome’s live shows—“it would’ve felt weird to record the songs any other way“—they did enhance the arrangements with additional strings and keyboards, and an attention to sonic detail, particularly the quirky percussive touches that add color throughout. 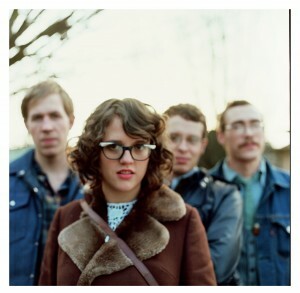 Even before their full-length was finished, the group’s accomplishments were significant enough that Portland music insiders crowned them the Best New Band of 2010 in local alt-weekly Willamette Week. In 2011, with Dirty Radio ready to serve as a calling card and the open road inviting them to bring their live show to audiences everywhere, Sallie Ford & The Sound Outside is poised to receive similar accolades from coast-to-coast and beyond.